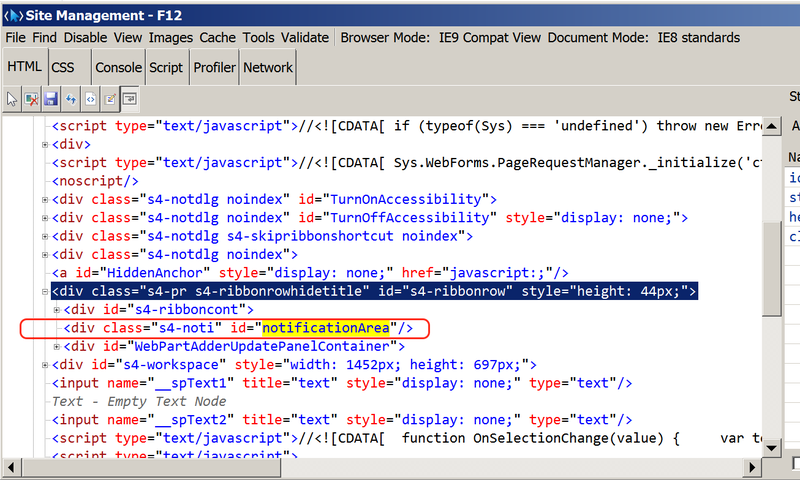 When developing a site or application page in SharePoint the ribbon control will typically be excluded from the modal display since it is outside of the modal dialogs rendered output (see SharePoint CSS class s4-notdlg). However, with a little jQuery, you can display notification’s inside your modal dialog. The only important thing about this DIV is that it should have absolute positioning. Here we move the existing notificationArea DIV to be a child element of our new container DIV (newNotificationArea). I also adjust the notificationArea‘s right CSS property, to position it correctly within my application page.